In Herald Tribune’s “Crist plan counts on stimulus“ Joe Follick reports that Florida’s governor Crist is proposing four constitutional amendments that lawmakers would have to approve for the 2010 ballot. The four measures would cap annual assessment increases on non-homestead property at 5 percent (reduction from 10%), provide a five-year super-exemption for first-time homebuyers, prevent assessment increases when a home’s market value decreases and cap local government revenue growth. The governor is oblivious to the swooning state revenues is counting on Federal bailout funds to carry Florida through the current crisis. Doesn’t sound to many like a sustainable plan. Perhaps the disastrous state of Florida’s economy and real estate value will drive the state to modify its discriminatory posture toward non-resident property owners. But realistically, I have seen no encouraging signs that the state may eliminate the homesteaders’ disproportionately favourable treatment. As far as I know there still are a couple class action constitutional challenges under way, but I have no visibility as to the their rate of progress or likely outcome. They are winding through Florida Courts where I suspect there is low probability of getting satisfaction. Ken Kania’s case in Federal Court has ground to a halt due to the current state of his health. Afterwards, the cases need to be taken to the Supreme Court, if the Court accepts them. The good news, if you can call it good, is that with the precipitous (30-50%) drop in property values in Florida, gradually the assessed property values for tax purposes have been falling as well (though slower than the prices); it is realistic to expect another drop this year (hopefully). 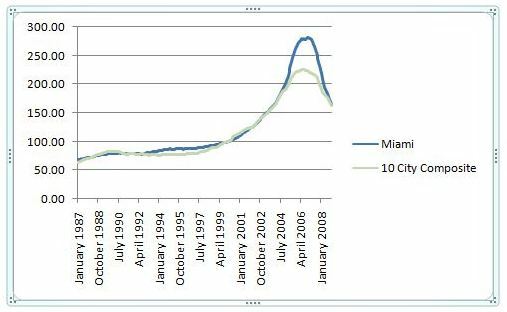 As you’ll note from the following graph according to the latest Case-Shiller Home Index Reoprt Miami (and U.S. ) property values decreased over 2.5% in December 2008, with no sign of a a slowdown in the relentless fall of property values. The bad news is that with the falling property values it is not just the non-homesteaders who benefit, but the homesteaders as well. So Floridians who bought property between 2003-2006 now are getting lower assessed values, that in the future will be locked into that lower level. If/when property values start their upward climb again, homesteaders will now be locked in at a maximum 3% increase in assessed value per year from that new lower base, while non-homesteaders will have their assessed values move up again in step with the market (though there is now a 10% cap). Therefore I wouldn’t count on sustained reduction in the gap between homesteaders and non-resident property owners. The worst case scenario is that as property values fall, mil rates will rise to maintain the incomes of municipalities and counties, and if prices will rise then non-homesteaders’ property taxes who plan to be long term owners will go even higher, thus offloading an even greater proportion of costs on out-of-state property owners. Not sure if these ruminations are of any value to you (who is a non-hoesteaded property owner or are thinking of buying in Florida0, but the reality is that nobody knows what the future may hold. And yes, it could move to a fairer approach, but so far nothing that I have seen gives even the slightest indication of that; so far all implemented changes have always made things worse for the non-homesteaders. Only the massive drop in property values has been “good”, at least from a tax perspective. SmartMoney’s Lisa Scherzer in “Slash your property tax”encourages property owners whose appraisals for tax purposes have not kept pace with the falling real estate prices in their area to consider challenging their valuation. She suggests that you can do this yourself, and a good place to start is your town/county’s property appraiser’s website; check for factual errors on your property description and look at comparable properties. Palm Beach Post’s Jeff Ostrowski writes that “Foreclosures spark HOA fee hikes”. He quotes from a survey of property owners that with growing number of foreclosures condo and home owner associations are simultaneously cutting services and raising fees, because “lenders who have foreclosed on properties aren’t paying assessments they owe”. The majority of the surveyed owners also report still growing vacancy rates over the last 12 months and predict no improvement over the next year. Still not a pretty picture on property taxes, but at least it’s a lot warmer than up north! But then of course renting is still cheaper than buying, so you could be warm without being ripped off on property taxes here.